As we get ready to head out to Vegas for Defcon I wanted to put in a plug for Infomation Security Day. schannel Force RPC pipe connections to be sealed with 'schannel' (NETSEC). Assumes valid machine account to this domain controller. schannelsign Force RPC pipe connections to be signed (not sealed) with 'schannel' (NETSEC). Assumes valid machine account to this domain controller. Using "lookupnames" we can get the SID. Once we have "a" SID we can enumerate the rest. You get the idea, was pretty much the same for the Ubuntu guy cept that his user accounts were -3000. Hydra v5.1 (c) 2005 by van Hauser / THC - use allowed only for legal purposes. I anxiously awaited reading and putting this book to use. Fuzzing is one of those “mystical” concepts that the people cranking out exploits were doing and I wanted to be able to use some of the publicly available fuzzers to fuzz for vulnerabilities and join the ranks. I thought the book excellently covered the theory portions of fuzzing. The format of theory/background of a fuzzing method (Environment Variable and Argument Fuzzing, Web Application and Server fuzzing, File Format Fuzzing, Network Protocol Fuzzing, Web Browser Fuzzing, and In-Memory Fuzzing) followed with that fuzzing method Automation or on Unix and then on Windows worked perfectly. It was a good structure and informative. The Automation or Unix and Windows sections fit in well with the theory sections before it. I think the book falls a bit short on practical execution (case studies) of using the fuzzing tools. Granted I say this based on my own expectations of what I would like to see from a fuzzing book but also from what the authors say in the preface that we will get out of the book. They say, “We detail numerous vulnerabilities throughout the book and discuss how they might have been identifies through fuzzing.” Some of the case studies are exactly what I expected like case studies in Chapter 10, the fuzzing with SPIKE section in Chapter 15, and the Complete Walkthru with Sulley in Chapter 21. Some of the others fall a bit short. I expected a lot more out of the ActiveX fuzzing sections (chapter 18), the Shockwave Flash example in Chapter 21 was useful for the discussion of creating a test case for a protocol but after 11 pages of mostly code in the last section we basically get told to load it into PaiMei and “go fuzz”, and while the theory parts of chapter’s 7 & 8 were great, telling me to find an AIX 5.3 box to see some example environment variables and argument vulnerabilities was less than useful. It would have been much more useful to use some of today’s fuzzing tools to find some old vulnerabilities in something like *BSD or old RedHat distributions, something I might have in the lab or at least something I could install in VMWare. Likes: Theory, background, discussion of how and why they built the “author built” fuzzers they cover in the book, some of the case studies gave me everything I needed to reproduce on my own in the lab. Providing the fuzzers on the companion website was great as well. The George Bush quotes were hilarious as well and made me look forward to each chapter so I could get another quote. Dislikes: some of the case studies I don’t think went into enough detail (no step by step instructions), I think the explanations of the blocks of code could have been better and numbering lines so we could refer to them in the text would have helped. The discussion of the existing frameworks was a little bit light (but we do get told to go the companion website for more info). Ideally we would have walked thru a couple of easy examples using multiple fuzzer frameworks to get us from advisory to EIP= 0x41414141. That would have been nice to see. Overall a great book, it has a place on the bookshelf next to shellcoder’s handbook and some other programming books and it will be used (many times) as a reference to play with the various fuzzers available out there. Over on SecurityFocus.com Don Parker posted an article on Security conferences versus practical knowledge. Overall I see his point that the talks given at the average security conference actually gives little to the average participant to bring home to put into effect into his/her network. He asserts that the training given at conference (usually 2+ days before the talks) is top notch but the speakers fall short. He also says that a security conference focusing on "practical knowledge" would be far better. "Today's computer security conferences no longer offer relevant or practical knowledge to the attendee. Be honest now, when was the last computer security conference that you went to where you came away from with several ideas to implement immediately onto your networks? I would wager none. " "What my not making the cut sank home for me though was that there are precious little practical talks going on today at computer security conferences." We have done this to ourselves by demanding that we hear talks on the latest research and 0-day, brand new exploit attack vector, uber l33t hack tool, etc when we go to these security conferences. At some point we moved away from talks on practical widespread attack vectors on our network to teeny tiny attack vectors because all the "practical talks" have been given already and why do people want to pay tons of money to hear someone talk about research or information that everyone already knows? Avi Rubin's keynote talk on vulnerability disclosure. Do i do this every day, no. But great information to know when i have a enough fu to worry about doing disclosures. Matt Fisher, Cygnus, and PresMike's talk on Web Application Incident Preparation. Again, i dont run a web server but if i did i would have gone back and looked at what we had in place to deal with incidents that could occur thru my web app. Chris Paget's talk on WPAD, if we were using it, would have been a talk i would have had to sit down at the keyboard and do some fixing on. There was more, i wont list them all, hell even the guys talking about guns was worthwhile but not something i could have used at work. "It is not everybody who can attend today's cutting edge security conferences and actually walk away having learned something. What is it that you are going to get out of it, and just how will it benefit our network? If the answers aren't there, you're not going. Practical knowledge is where it is at." My point is that i think people (anyone if they have some brain cells and interest) do get things out of conferences even if they cant directly put it into action at work. New ways of thinking about attacking problems, hearing about things that will most likely become issues later, in my opinion is invaluable much for the same reason that subscribing to security mailing lists has value despite the noise, already knowing about that exploit you see on CNN or some of the other online computer site a few days after the code was dropped has value. Frankly being around some of the researchers that have that much "fu" is also valuable because it can show you that what's out in public knowledge about a system is probably not even remotely all that is known or doable with the system not to mention just the inspiration of being around some of these people with that much security brainpower. You wanna get motivated, go listen to Dan Kaminsky talk about bending DNS packets to his will or HD Moore 0wning some un-ownable app, or if packet fu is your thing go listen to Richard Bejtlich or if you are into reversing go listen to Havlar Flake. if that doesnt inspire you to do some work in the home lab or crack a book to be a better security guy/gal, well i dont know what to tell you except to maybe look at why you are in the field. At least it can maybe now justify the cost of training you can take at the conference since you usually get access to the talks for free if you took the training. On the other hand, how often has it been that the "obscure non-practical theory/idea" talk actually turned into a huge attack vector? I'm sure the people that first listened to a talk on the supposed vulnerabilities in WEP didn’t really come home with the "practical knowledge" to do anything about it on their networks, but we see later how widespread and dangerous of an attack vector it was. Unfortunately people don’t give a crap about a new vector (it isn’t practical yet) unless the guy is dropping a kiddie friendly tool anyway, then maybe they'll go home and fix or upgrade the network to defend against the attack. Another thing to think about is how do I justify to my boss sending me to a conference where they are going to talk about "practical knowledge" that I can 1) probably get in town from a local training center or 2) from a book for significantly less cost? Don’t get me wrong, I’m all for a conference where I get something practical out of every talk but I would think its hard to organize a con like that because what might be new information for me might be old news to you. Of course that's probably why there are different tracks and more than one talk going on a time. Valid points though, something for those con organizers to think about at speaker selection time. so all that yaking, what's the point? the point, if you just scrolled down to the bottom, is that being able go back and make a change or implement something new on your network after a security con attendance is a poor metric to judge a conference selection of speakers or the value of the conference or of conference attendance. The value of a security conference is more than the talks and beer drinking (both important parts though) that can be done at the conference. The inspiration to do/learn more, exposure to new concepts/methods, and networking with like-minded individuals can pay dividends later as well. Over on darknet.org.uk they had a post on metasploit and said that my video i posted over on EthicalHacker.net was "The most up to date video for Metasploit 3 can be found here:"
Over in LSO-Chat we were talking about SNMP Enumeration and why you would want to do that and what kind of information you could pull from a SNMP service even with only READ permissions available. Not a bad little bit of info. Now, realistically would you see this from outside the firewall, I hope not. But on an internal assessment you may be able to use SNMP to pull off a list of username to try some password attacks, verify patch level, check out what ports are listening, and see running services. All kinds of fun stuff. another fun tool is snmpwalk. its not for the faint of heart, you need to know what MIB you are looking for otherwise you can get information overload. As you can see, its a stout program. we can use grep to narrow down some info. If you have grep kung fu you can use some "cuts" to get just the software name. HOST-RESOURCES-MIB::hrSWInstalledName.1 = STRING: "freeSSHd 1.0.9"
HOST-RESOURCES-MIB::hrSWInstalledName.2 = STRING: "freeFTPd 1.0.8"
HOST-RESOURCES-MIB::hrSWInstalledName.3 = STRING: "CesarFTP 0.99g"
HOST-RESOURCES-MIB::hrSWInstalledName.4 = STRING: "Microsoft SQL Server 2000"
HOST-RESOURCES-MIB::hrSWInstalledName.5 = STRING: "PeerCast (remove only)"
HOST-RESOURCES-MIB::hrSWInstalledName.6 = STRING: "TFTP Server TFTPDWIN version 0.4.2"
HOST-RESOURCES-MIB::hrSWInstalledName.7 = STRING: "Bitvise WinSSHD 4.19 (remove only)"
HOST-RESOURCES-MIB::hrSWInstalledName.8 = STRING: "VMware Tools"
HOST-RESOURCES-MIB::hrSWInstalledName.10 = STRING: "UltraVNC v1.0.2"
MS Technet "How SNMP works"
Ok while talking about movies is not totally security stuff, there was a bunch of SCADA hacking going on in the movie that was entertaining. I thought the movie was good, except for one part where the kid pulls out what looks like the PIN cracker from the terminator movie and it cracks the PIN for a door protecting these NSA servers. I don’t want to say that the rest of the movie was “believable” but the hand waving and magic at that point kinda disappointed me because they did such a good job with the rest of the flick, ok well. There were some rumors going around that there would be some metasploit action in the movie but there wasn’t. Kinda disappointing in that respect, that would have been almost as exciting as the SSH attack in the matrix. more on the SCADA stuff, there has been a lot of talk for years about SCADA vulnerabilities, hell you can even get a class on it by InfoSec Institute. Obviously the issues rises when you have a system that runs on, really any OS, that requires internet access yet you cant patch the box. DoD has systems like this that run some special application that if you patch the box it breaks the application or you’ll have crap that only runs on windows 98 or Windows 2000 SP0 and no one wants to pay to have someone redevelop the application and instead would rather get the whole network, VLAN (hopefully), or segment owned. For the life of me I cant imagine what guy accepted an application that runs on a computer that could never be updated but I am sure they had their reasons (ignorance, bribes, etc) but I think that time and money would be better spent developing a web solution that can do the same thing. That way you have to worry about keeping secure the ONE server, application, database, etc instead of the multitude of computers spread across the world. Anyway, I’ll go on the limb and say that ‘security by obscurity” has been proven ineffective and we should definitely move away from that especially when (national) infrastructure is involved. Blackjacking takes on the task of educating both administrators and management about the threats of mobile devices to their enterprise. I believe this book succeeds in its task and serves as a great reference not only for the blackberry enterprise server (BES) administrators out there but also for the network administrators, help desk personnel, security personnel as well as a book that can aid in the education of the end users. It is written in a tone and dialog that can be useful to the technical reader and non-technical reader and does well digging into the relatively new field of mobile device (especially BlackBerry) security. The book starts out with a very good overview of the threats to mobile devices (Malware, Direct Attack, Data Communication Interception, Spoofing and Sniffing, and Physical Compromise). It then moves into an excellent overview of the devices that will be covered in the book (BlackBerrys, Pocket PCs, Palm Handhelds, and Cell Phones). The BlackBerry section (which is probably why you are thinking about purchasing the book) does a great job covering the current and future attacks given the fairly limited publicly available research, tools, and code and gives solid advice on setting up your network infrastructure to deal with the growing threat with mobile devices. The vignettes discussing plausible attacks for each attack scenario serve as good feasible examples to think about for your enterprise and users and how to protect your network. Likes: Discussion of how BlackBerry communications work with your cell phone provider and within a BlackBerry Enterprise Server environment, all the background material on the BlackBerry device, multiple examples (for further research on what is best for your environment) for AV and firewall solutions for each type of device, and seeing attacks on most of the threats in the lab using available tools. Dislikes: while not in the scope of the book more code examples would be nice (of course it would take away from the usability of the book to “non-technical” people) and the book didn’t list links for the tools and malware discussed (yes I know Google exists). Overall an excellent book. I purchased the book for my BlackBerry admin (but I read it first ☺) and I think he will find it useful since he is not a “security” guy. It really ties together networking best practices and technologies and while not a “BlackBerry (or mobile device) or network lockdown guide” blackjacking serves as a good reference for further research into AV, firewalls, and VPNs for mobile devices as well as safe methods for allowing those devices entry and access into your network. SQL injection digger is a command line program that looks for SQL injections and common errors in websites. Look for SQL injection in a webpage, by looking for links. Submit forms in a webpage to look for SQL injection. Crawl a website to perform the above listed operations. Perform a google search for a query and look for SQL injections in the urls found. sqid v0.3 - SQL Injection digger. -m, --mode MODE Operate in mode MODE. g,google Operate in google search mode. u,url Check this url or a file with urls. c,crawl Crawl website and check. -q, --query QUERY QUERY to perforn google search for. -r, --results RESULTS number of results desired, default is 20 if not specfied. -u, --url URL check this URL. If URL is a file urls will be loaded from this file, specify each url on a new line. -p, --page PAGE Check this page. -c, --crawl WEBSITE Crawl website WEBSITE and check. -C, --cookie COOKIE Cookie in the HTTP header specify as name=value,name=value. If COOKIE is a file cookies will be loaded from this file, specify each cookie on a new line. -a, --accept-cookies Accept cookies from the webite or page. Default is no. -R, --referer REFERER Set referer in the HTTP header. -B, --auth CREDENTIALS Use credentials as basic auth for the website. -o, --with-noquery Match page content without query parameters. Default is false. -D, --db-files FILE,...,FILE Use file(s) FILE,...,FILE as signature database. -t, --trigger TRIGGER Use TRIGGER for detecting SQL injections/errors default is '. If TRIGGER is a file triggers will be loaded from it. specify each trigger on newline. Lines starting with a # are ignored. -T, --time-out TIMEOUT Timeout for response in seconds. -U, --user-agent USERAGENT User Agent in the HTTP Header. Default is SQID/0.3. -P, --proxy PROXY User HTTP proxy PROXY for operations. -A, --proxy-auth CREDENTIALS Use crendtials CRENDENTIALS for the proxy. [+] Getting 50 links from search inurl:page.asp starting from 0. [+] Done got 50 links. [*] Going to check 50 urls. [*] Warning: Client error 404 Page not found, http://policyresearch.gc.ca/page.asp?pagenm='. Error getaddrinfo: No address associated with nodename, http://www.airindiaexpress.co.in/page.asp?pageid='. [*] Going to check 1 urls. [+] Getting links from page http://www.site.info/. [+] Done got 2 links. [*] Going to check 2 urls. [v] Loaded 21 signatures from sqid.db. 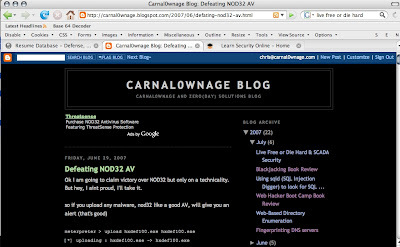 [*] Warning: Client error 401 Authorization Required, http://www.carnal0wnage.com//pvt/phackvideos.html. [+] Done got 32 links. [*] Going to check 32 urls. by default, sqid will only check for SQL injection with " ' " you can add your own trigger file if you want. [+] Getting 20 links from search inurl:login.asp starting from 0. [+] Done got 20 links. [*] Going to check 20 urls.